Christmas is creeping up on us and you guys have been busy making so many lovely things that we thought we should feature some of our favourites! We have had to narrow this down to our favourite 9 as there were just so many great designs out there. These talented makers have inspired us with their creativity and made us smile by capturing the Christmas spirit. 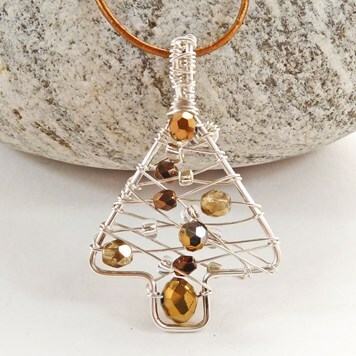 This twinkly wire and bead Christmas tree pendant is made by Beau Bella Jewellery, perfect for the festive season and available in many different colour options. We love that this pendant design can be created with just a few components - two gauges of your choice in wire and your favourite beads, and yet still be so eye-catching and charming! As the Jewellers Product Description states: a great addition to your Christmas outfit and a lovely gift or stocking filler! Available from: Beau Bella Jewellery on Etsy. 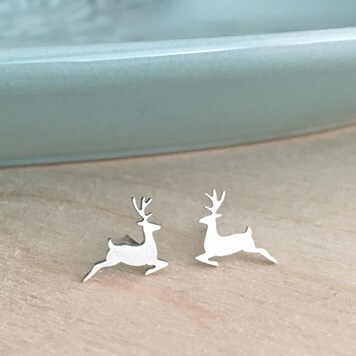 These Reindeer studs by Sarah Lucie Jewellery have been carefully hand pierced out of solid Sterling Silver and are a subtle yet very cute little addition to any Christmas outfit. A matt finish has been applied to give a soft sheen to the metal. We think the attention to detail on the shape of the stud and the little antlers make this design so special. As the jewellers Product description says ... Christmas without reindeer is like snow without moonlight: it loses its sparkle! 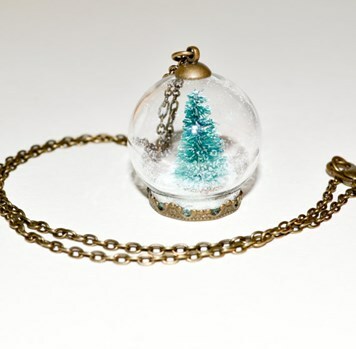 This unique little Snow Globe necklace by Flo Nightingale is such a lovely, quirky idea and would be an accessory bound to attract compliments. Made using a clear glass globe encasing a tiny brush Christmas Tree, with a sprinkle of sparkling iridescent glitter 'snow'. The ornate bronze plated base is securely glued, and it dangles from a bronze plated chain. As the jewellers product description states... "Oh Christmas tree, Oh Christmas tree, Such pleasure do you bring me!" Charlotte Bezzant Jewellery has created this beautiful Sterling Silver branch bangle, which reminded us of Christmas wreaths and twig decorations adorning peoples homes, but this has that extra sparkle to adrorn your wrists! 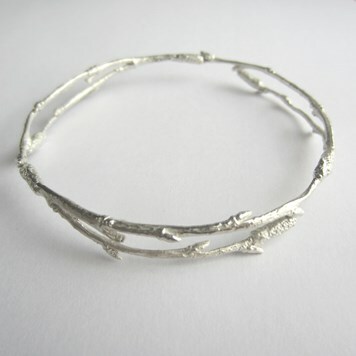 The beautiful design has such an interesting creation - small birch twigs picked in the Arctic by the jeweller and then cast in solid Sterling Silver. This allows the bangle to be so detailed that you can see the emerging buds. Three twigs have been joined together to form this bangle. Silver Bird Designs have created these cute little Robins which are available as studs, drop earring, brooch pins and necklaces... we love them all! 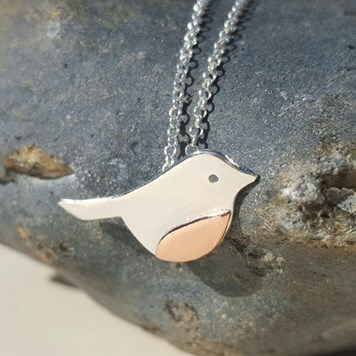 They have been created using sterling silver sheet for the main body and copper has been used to create the robin's red breast. A mixed metal partnership made in heaven and the perfect addition to any outfit throughout the autumn / winter period. This amazing sterling silver snowflake ring from Sea Surf Rocks instantly grabbed our attention. 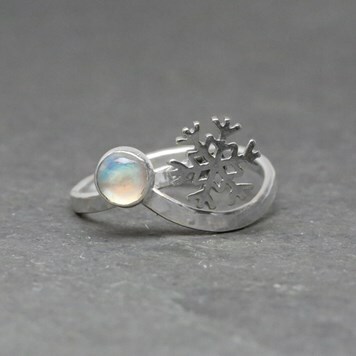 With a snowflake charm and rainbow moonstone sitting perfectly on the unique wave band ring, it is a handmade, Christmassy masterpiece! Made by soldering a bezel cup to one end of thick silver wire and a sterling silver snowflake charm to the other end. Then forming it round into a ring. This little chap is made by Jewellery FurKeeps who specialise in making the cutest little animal jewellery. This Reindeer brightened up our day it's cheeky little face. 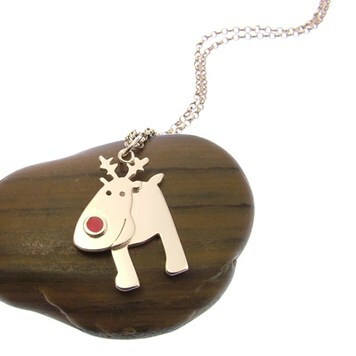 This is a clever design that can be created by piercing the different layers of the reindeer from sterling silver sheet and soldering on top of each other - You could then solder a bezel cup for a nice bright red ruby or garnet stone to create his nose. 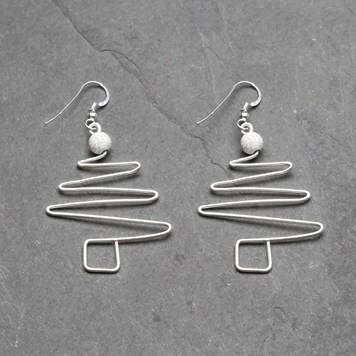 These little enameled Christmas tree earrings are by wue and we think they are perfect for someone who prefers a more subtle style when it comes to jewellery. They are small but packed with festive spirit using impressive detailed enameling on little cast Christmas tree shapes and then fired to give this lovely bright glassy effect. We also love the quirky packaging of all of wue's products, so great for Christmas gifts. This may be blowing our on trumpet, but these ones are by us - our latest Make The Look project! 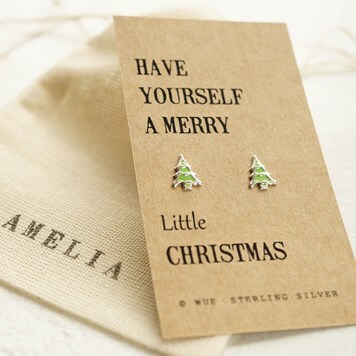 We really love the simplicity yet effective look of this design and think they could accompany any Christmas outfit. Plus they are accessible to jewellers of all levels and easily personalised - by choosing your own bead for the top of the tree and any you may like to add on the way down. To go to step by step instructions and a list of everything you need to make these earrings Click Here. We have really enjoyed looking through Christmas inspired creations and would love to see more!